Hearts midfielder Peter Haring has hit back at journalists who picked Inverness CT to win the Scottish Cup semi-final clash at Hampden. The Jambos went into the match as heavy favourites seeing as they were playing in a league above their opponents and had already beaten them 5-0 this season. They were able to further prove that superiority with a 3-0 victory to book a meeting with Celtic at the end of May. 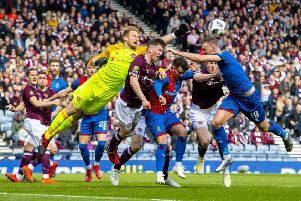 Many football pundits had backed Inverness CT to cause an upset with Hearts having struggled to get past another Championship side, Partick Thistle, in the previous round. They were also going into the match with just three victories in their previous ten games and an Edinburgh derby defeat to Hibs. Haring, though, believes it was foolish to have expected anything other than a Hearts win. He said: “Last week was tough. Of course we lost the derby but I don’t think we deserved it so it was even harder for us. “With all due respect to them they are doing quite well but we are still Heart of Midlothian. All of our players and all of our staff knew we would be the better team.